It is very important for traders to understand how to distinguish trendy markets from sideways. Why is it important? Because knowing this, traders can determine which approach to take for the market. To look for trend patterns, we usually see repetition patterns, for example, High Higher (HH) and Higher Low (HL) in the rising market. In a declining market the pattern formed is usually Lower High (LH) and Lower Low (LL). 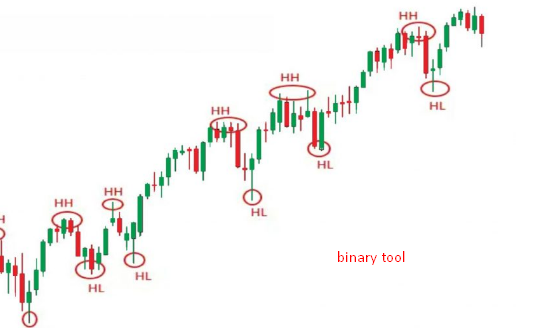 The following are examples of markets that clearly tend to be higher as evidenced by the repetitive patterns of High Higher (HH) and Higher Low (HL). How do we know when a new trend has started or the old one has ended? In a forum discussion, U.K. explain using price action analysis techniques we will find out. Look at the pattern, namely High Higher (HH) and Higher Low (HL) or Low High (LH) and Lower Low (LL). For example, after you see a disturbed or damaged pattern of High Higher (HH) and Higher Low (HL) at the price that makes Lower High (LH), this is an early warning that the uptrend may end. To really consider that the uptrend has ended and a new downtrend has begun, we need to see at least one pattern of LH and LL. That means, once the price makes the first Lower High (LH), so that it fails to make Higher High (HH), we then need to see it make Lower Low (LL) follow Lower High (LH). At this point, we can start looking right into the market to be a seller. The next way that we can use to differentiate trend markets and sideways markets is to use moving averages indicators. Moving averages provide visual clues that are easier for beginners, but must be used in combination with the price action strategy discussed above. Basically there are two things to look for when using moving averages to differentiate trends and sideways markets. One, when the direction of the line intersects as shown below by the red arrow. We can only use a 'crossover' to determine the direction in traditional moving averages crossover transfer systems. The second thing to look for is if the average moving line is diverging (away) between each other, as in the picture shown by the blue arrow, because this shows a very strong market. However, you need to combine the price action technique from one point, as a filter, because moving averages will sometimes trick you if the market is limited. They are really only used as a quick reference to find out the direction of trends, see areas of value, find the right time to buy and sell. We can also use key support and resistance points to determine whether the market is trending or not. The basic approach is to simply look for prices that clearly oscillate between parallel levels. If you bounce between two parallel levels, then you have a market that is bound by boundaries or sides, not a trendy market. There are two basic types of sideways markets, namely when the market looks choppy and has limited reach. Now, after we know three ways to distinguish market trends and sideways, it will be easier to determine the moment right in the market. And all three methods are only part of many ways to find out market conditions.